I love ratatouille. It’s ultimate feel good, yummy veggie food and perfect for tonight after a long day helping out on a school trip. The trip to a farm with 40 very well-behaved reception children was bundles of fun – I’ve never felt so popular with a dozen children queuing up to hold my hand! Serve it with dauphinoise, in a tart, with a jacket spud, a bowl of rice, as a side dish or just with a hunk of bread. A few top tips (concurred by the French side of the family): it is a hundred times better if you individually cook all the veg in stages before combining, take your time cooking it, developing the flavour of each ingredient and don’t scrimp on the seasonings. I also like to remove the less palatable centre of the courgettes and aubergine, but if you haven’t got time, don’t. – Fry off the onions and peppers until golden brown. Set aside. – In the same pan, fry off the courgettes and garlic until golden. Add the herbs de provence. Set aside. – Next the aubergines. Then the mushrooms. – Combine all the vegetables into one large pot, heat well. – Add the tomato puree and cook out for a couple of minutes. – Add the chopped tomatoes, splash of balsamic, seasoning and a splash of water. – Reduce the heat and cover the pan (with a cartouche if you want to be chefy! – a circle of baking paper) and cook gently for as long as you like. The longer the better! – Take the cartouche/lid off. Reduce a little if too watery. – Check seasoning and stir in the parsley. Previous Post I don’t know, but I suspect…. Ever since that movie came out I wanted to try making this! I’m going to come back to this for sure. The film’s great isn’t it! 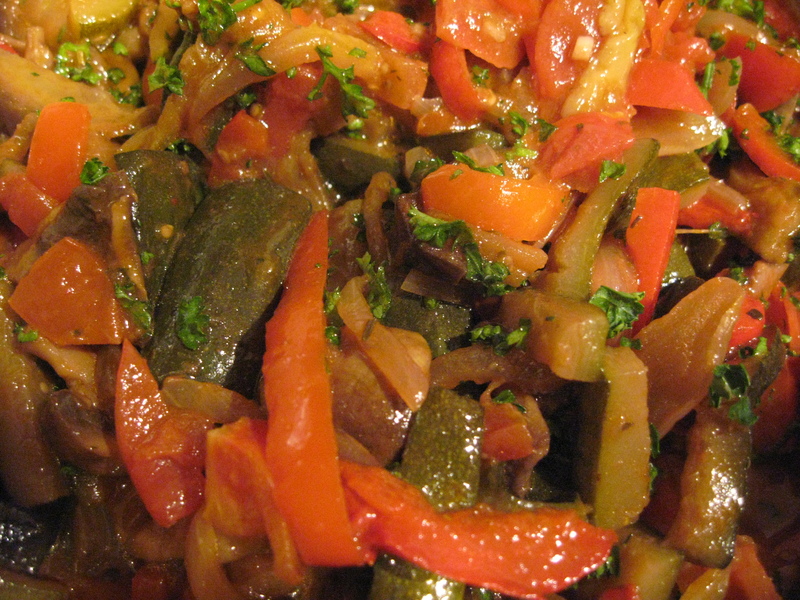 Hope you like the ratatouille – it’s the taste of the South of France!